IS IT SAFE TO TRAVEL TO IRAN AFTER TRUMP’S TRAVEL BAN?? But we had paid the fares, bought our travel insurance and collected our prescriptions, so backing out from our visit to the cradle of western civilisation was not an option. If the venue had an unbelievable touch, so did the flight from Auckland to Doha. It is the longest commercial flight in the world, taking the equivalent of over two working days, sitting on one seat. Fortunately, Qatar Airways is a superb airline, providing great service and excellent food. Doha, the capital of Qatar, is a major hub for flights all over the world. The airport oozes wealth and superb architecture, and its arrival/departure boards are a multi-choice geography test. The flight from Doha to Tehran, capital of Iran, was a wonderful geology lesson that was amplified later as we toured by road. The land is contorted into ridges, folds, rifts and mountain ranges because three tectonic plates collide in this region. Politicians are not the only source of pressure on Iran. 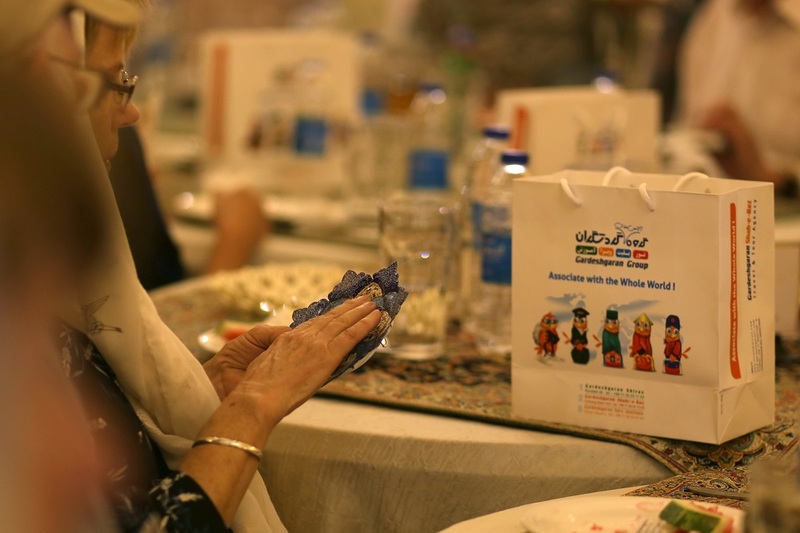 Unlike New Zealand, which is surrounded by sea, Iran has land borders with six other countries, and is near neighbour to at least six more, whose religions, politics and history bring various degrees of friendship to everyone’s relationships. History is at the very heart of Iran, because the country today is the core of what were fluctuating Persian empires spanning more than 3,000 years. At its largest, ‘Persia’ reached from Delhi to the Danube, but some of the greatest names in the history of bloodshed have also imposed their wills upon Iran – Alexander the Great, various Roman Emperors, Genghis Khan, Tamerlane, the Ottomans. I wondered if today’s despots seem like ‘more of the same’ in the cultural memory and psychology of this country. Though Kings and empires have come and gone, one constant feature in Iran, and a wonder for tourists today, is the Paradise (=Persian) Garden. The first one was created at Pasagarde in about 500 BC, and its remnants are still discernible today in a semi-desert that was a fertile valley at that time. The basic concept of the Persian Garden – water, trees and flowers – came to be expressed in many ways, at mosques, palaces and homes. Long, reflecting pools, waterfalls, fountains and bubbling channels sit within flower beds and slender cypress trees. One of the finest is the Shah Zadeh garden whose tranquillity arrests the onward rush of even the most ardent tourist. But, beguiling though the Paradise Gardens are, two great centres, the ruins at Persepolis and the mosques and palaces of Esfahan, are the tourist magnets. Iran is rich both in ruins from past civilisations and in glorious Islamic architecture. Many of both are UNESCO World Heritage Sites. Perspolis, is the remains of a palace complex conceived 2,500 years ago by King Cyrus who wanted to display the might of his Persian empire to emissaries paying homage. Cyrus brought designers and artisans from the far corners of that empire. The result, with additions by later Kings, includes great staircases, monumental gateways, friezes carved in stone, statues, and tall columns that are the only remains of many buildings. Persepolis stood in a fertile area then but, in a drying climate, the exquisite stone carvings look as sharp now as when skilled artisans created them. Another ambitious empire builder, Alexander the Great, burned down the wooden interiors in 330 BC, so that today we see only the imposing stone remains, standing above the desert on their platform of massive blocks. The top tourist destination in Iran is Esfahan, a city of craft artisans, tree-lined boulevards, Persian Gardens and spectacular Islamic buildings. Hundreds of metres of covered bazaars are a shopper’s paradise. Metal and stone craft, works of art, fabrics, carpets, domestic ware, meats, jewellery, a huge array of fruit and vegetables, and sacks and bins of indeterminate spices, are all there in profusion. You can watch silver being engraved, copper being beaten, and semi-precious stones being set. The sights, smells and sounds are marvellous. Long arcades and domes show that architectural skill, and unending imagination in brickwork and coloured tiles, are not confined to mosques and palaces. Driving around Iran, it is impossible not to be struck by sharp transitions in the landscape. In the valleys, grow cereals, figs, pomegranates, melons, and many vegetables. Within metres, when the slope changes, this fertile scene becomes semi-desert (with occasional flocks of sheep and goats), rocky slopes and mountain ranges. Layered rocks speak of an ancient land that has risen from the ocean, and the Great Salt Desert is further evidence of that. Enormous forces contorted those rocks into folds, and even pinnacles where erosion has eaten into softer layers. It is hard to imagine vibrant cities, great civilisations, and the productive land that would have supported them and their armies, where now there are barren landscapes and ruins. Everywhere in Iran, it is clear that water is as crucial today as it was in the rise and fall of great empires of the past. Politically, Iran is a theocracy governed by Shi’ite clerics who gaze down severely from billboards and buildings. Women, including tourists, must observe Islamic dress codes, such as head scarves and long gowns, but a younger generation is testing the boundaries with elegant garments that more or less comply. Alcohol is forbidden, but we adjusted quite happily, and realised how big a part alcohol plays in New Zealand society. Iranian food, and its gentle spices, is almost a vegetarian delight, with many dishes based on aubergines, tomatoes, lentils and beans, with or without meat. Even though English-speaking TV stations are rare in Iran, political matters were always evident. The effect of financial sanctions (over nuclear enrichment) was demonstrated all around the country by incomplete roads, bridges and buildings. General neglect is apparent, too, except in major tourist sites where restoration work is done with admirable support from UNESCO. While we were in Iran, Israel breathed aggression, and the USA announced yet tougher sanctions, but many other countries denied that Iran had breached its nuclear treaty obligations. Such is life in Iran. For us, coming from a land bordered only by benign ocean, it was strange to share at first hand the threats from nearby powers, and from a greater power so far away. The people of Iran do not need them, and probably do not deserve them. 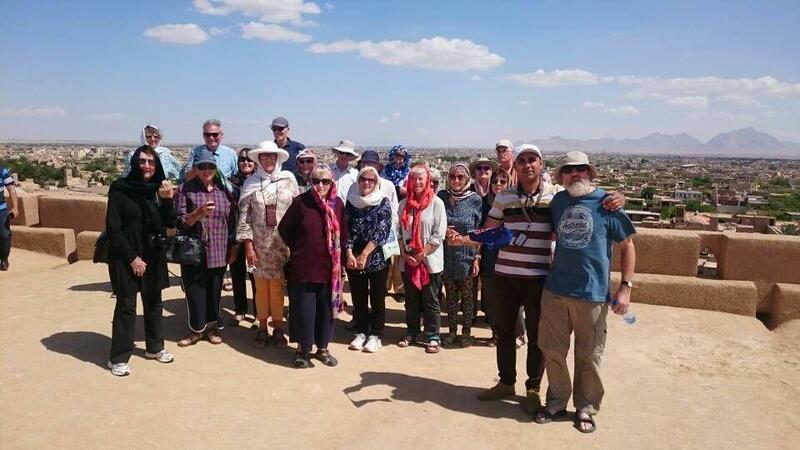 Our local tour company was called ‘Friendly Iran’, a name that truly reflects our experience of that country. Amir, our superb Iranian guide, assured us that we could walk anywhere at any time without fear for our safety. On the street, and in Persian Gardens, bazaars and mosques, we were welcomed. Children called ‘hello’, and they scampered away laughing when we said ‘hello’ back; teenage schoolgirls with smiling faces framed in headscarves, wanted to talk English, pose for photos and laugh in delight; adults extended their hands and asked us where we were from. Many of them knew where tiny New Zealand was, and that it was a beautiful country. They were appreciative that we had travelled from so far away to visit their country, despite what we may have heard about it, and what might happen to us. Iranians must be some of the friendliest people on earth, and anyone who visits their ancient and extraordinary country will be sure of a welcome.